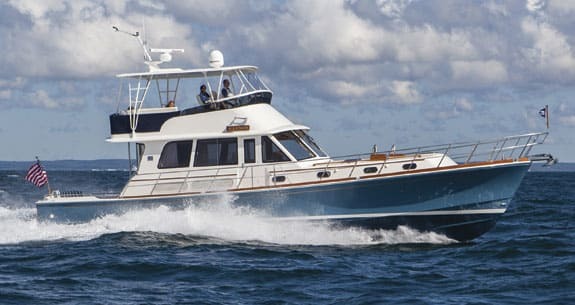 The Grand Banks 55 Eastbay FB follows the pedigree born nearly 20 years ago, and in doing so gives one family their perfect boat. It’s 7:33 am on a Saturday. The familiar echoes and smells of early morning cruise preparations flow through the open cabin doors. Dishes clatter in the sink. Fridges open and close as kids are corralled towards the saloon table for a breakfast that comes a little earlier than usual for youngsters on a July morning. Soft voices stream from the saloon across the cockpit and disperse into the waking Block Island anchorage. The aroma of freshly brewed coffee subdues the odor of newly varnished teak in the interior. New boat owner Josh extends a sweeping wave from the saloon door, directing us to pull along his starboard side where pristine Maine Point fender covers await our rather battered Glacier Bay. Josh casually walks around, tidying up the deck of Lenox—a brand-spanking-new Grand Banks 55 Eastbay FB—like he’s completed this routine a hundred times before, rehearsing the departure in his head, analyzing the gusty winds and current. 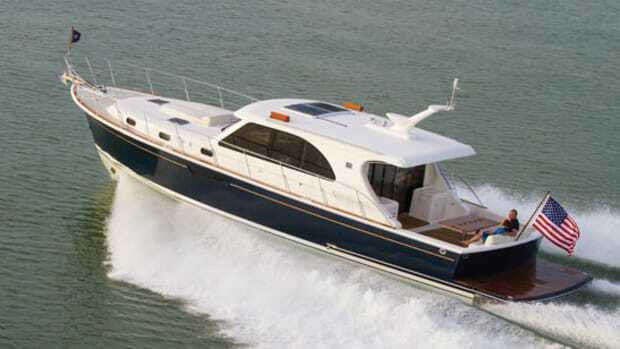 In fact, it’s not even a week since he and his wife have taken delivery of Lenox from Boatworks Yacht Sales. I secure the chase boat alongside with my friend and photographer Billy Black and jump onboard thanks to an extended arm from Josh. The chilled dew greeting my bare feet on the golden teak deck just feels right. This—this whole scene—is why we go cruising. And the 55 is certainly a yacht intended to leave the dock. “We looked at several other boats, including larger ones,” says Josh, who asked that his last name, as well as his wife’s and children’s names, be withheld here. “Yet in the end we decided we still wanted a boat that we could run ourselves,” he says, motioning toward his young family. 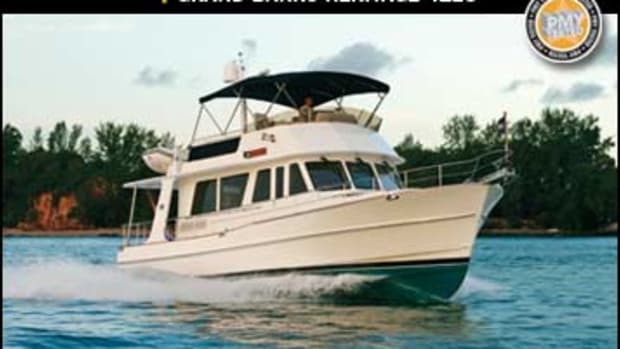 Their previous boat was a Grand Banks 42 Europa, which they cruised for ten years in New England. Josh and his wife refer to themselves as “fortunate,” having both enjoyed successful careers in hedge funds and investment banking. 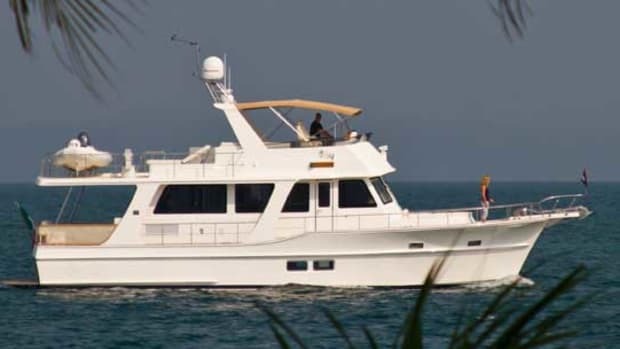 They possess the means to buy a far larger yacht with all the trappings and even crew. Yet after spending a day with the family and witnessing how they boat together as such a tight nucleus, already fully connected to Lenox, it’s abundantly clear why they selected this course. Introductions were made in the saloon as the kids finished up breakfast before our early morning run to Nantucket. Billy began photographing the deck details, while I examined the flawlessly finished teak interior. “Look here, these guys thought of everything,” Josh says, pointing to a drawer holding flatware and cutlery. I heard this sentiment throughout the day—an appreciation for the details executed by Grand Banks and a trust for this august builder. For full disclosure, I worked for Grand Banks in the mid ’90s and we always tried to accommodate custom requests, no matter how difficult. Yet often times the end result was a far departure from the standard boat and just didn’t work. Yet, Josh and his wife only specified two changes to the layout on Lenox, trusting instead that the layout designed by Grand Banks would work. “We removed the overhead cabinet meant to go here.” Josh’s wife points to the area over the after galley counter. “We didn’t want to obstruct the view.” Great idea, I thought, there’s plenty of stowage elsewhere. “And take a look down here in our son’s stateroom.” Behind the sliding teak doors on the port side was a huge double berth versus the standard twin awthartships arrangement. Opening hatches and ports and comfortable bedding created a plush haven for young kids or adults. Other than these two items, Lenox’s interior reflects the accommodations plan you see on page 40. A galley-down arrangement is also offered. Up on deck, Lenox felt as solid as a slab of slate. I was surrounded by shipshape details that shouted out to remind me that this Eastbay was not just a pretty face. Not some gussied-up debutante designed and built to twist upon a mooring outside of a yacht club eliciting praise of passersby. Nope, she is meant to go to sea. Whether it be a cruise way Down East, up the Inside Passage to Alaska, or a Caribbean jaunt to the Virgin Islands, as the owners of Lenox intend. The deck hardware was beefy and well finished. A stainless safety rail lined the wide walkaround decks, perched upon a teak caprail serving as a bulwark to keep feet firmly placed on the optional teak decks. A Lofrans windlass with remote switches on the bridge and the lower helm station serves the plow anchor secured to the bow platform with stainless roller. 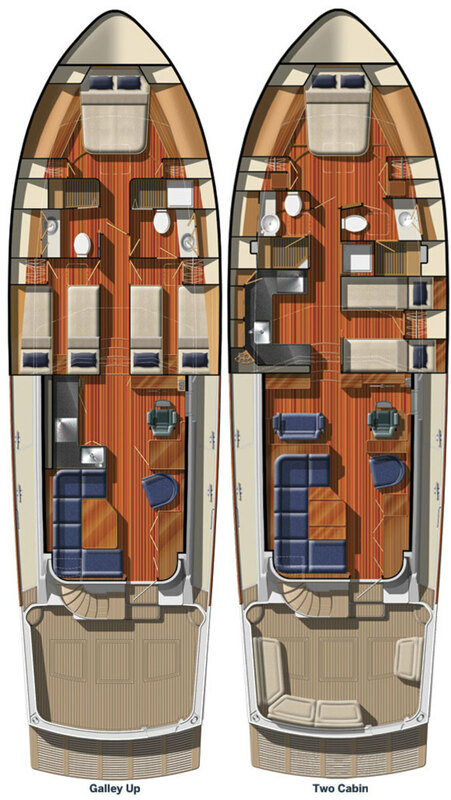 A side door offers easy transition between the lower helm and deck. However, I offer a note of caution. With this forward opening setup always make sure the door is tightly secured by its latch. The fingers of my right hand were crushed a decade ago when the wind caught a pilothouse door that was set up the same way. It came slamming back on my hand as I gripped the doorframe while docking the boat, and man did it hurt. 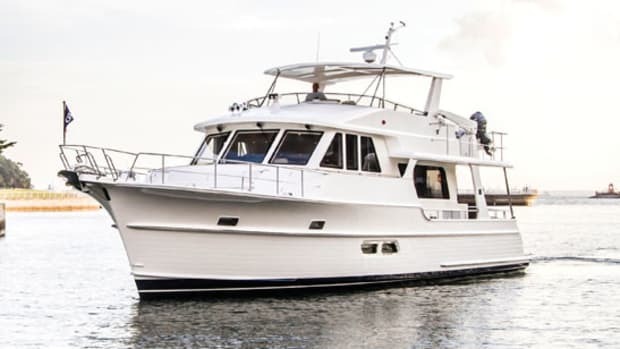 The forward deckhouse setup reminds me that Grand Banks’s production director Bruce Livingston built a whole bunch of sailboats during his career, including the iconic Little Harbor series for noted yachtsman Ted Hood. An exquisitely crafted set of teak Dorade boxes are designed to keep the air flowing into the accommodations below, and the set of teak grabrails provide an extra element of safety, especially for kids. The owners specified the extra teak options, including the transom. “I wanted to add a few similar touches similar to my 42 Europa,” says Josh. But the bridge version of the 55 corrects any aesthetic imperfections, in my opinion. The bridge draws the eye skyward and the mass of the large housetop is concealed. 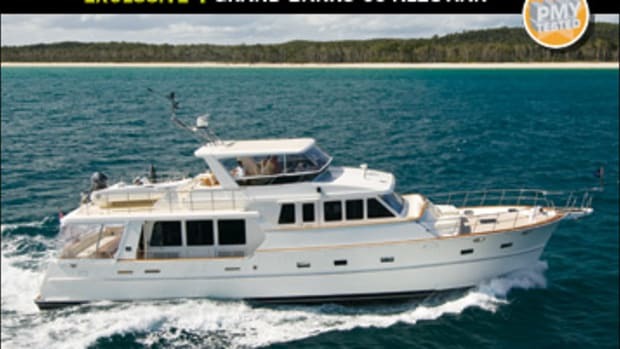 Of course, the Grand Banks-built hardtop could be brought down slightly unless you plan on hosting a few NBA players, and I would consider adding an overhead hatch or two abaft the helm for increased ventilation. Like her Eastbay siblings, the 55 rides on top of a C. Raymond Hunt Associates-designed deep-V. And boy what a ride! Like all Hunt hulls, there is a sharp entry forward and this V-shape is carried all the way aft to the transom. Take a look at the running shot on pages 38 and 39, and notice how the spray strips and hard chine forward lift the 55 and knock down the water. It’s hard to tell from these shots, but it was a blustery ride on Nantucket Sound that morning. Even with a stacked chop and full gear and load Lenox achieved a top speed of 34 knots. I didn’t even touch the tabs. 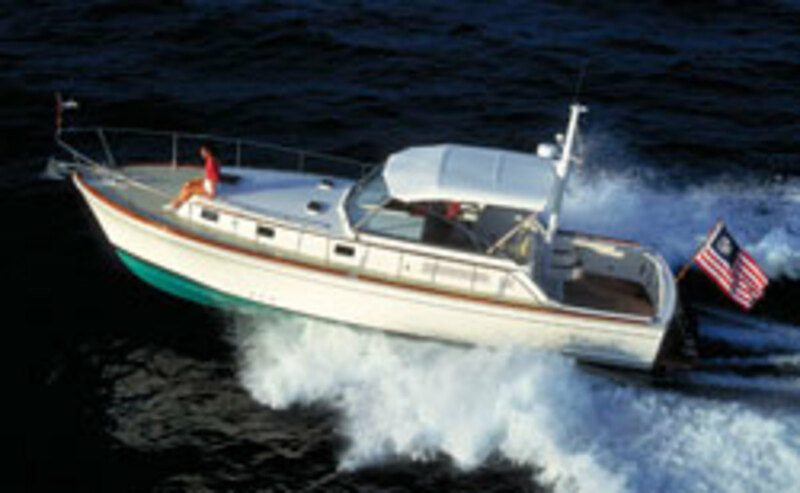 At 1950 rpm, or about 70-percent load, we galloped along at 26 knots. 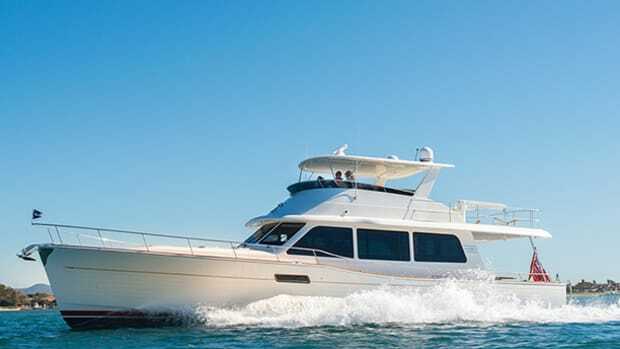 Take the throttles back to about a 56-percent load, and the speed settled into a very comfortable and economical 20 knots. With the short fetch behind us there was zero tendency to bow steer, and she banked into turns like a little wakeboarding boat. In fact, I subjected Josh and his family to a series of turns and maneuvers after we’d departed Block Island, but I couldn’t help myself. 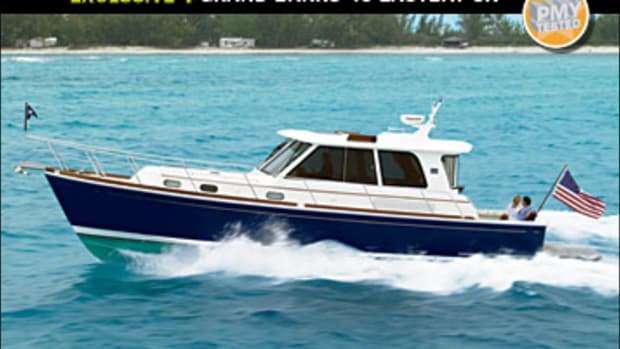 If you’re in the market for this type of boat, don’t even bother starting with an interior walkthrough. Just take this baby for a ride. Even at displacement speeds Lenox handled extremely well, partly due to the amount of hull that V places in the water at these speeds. Although in my opinion having a trolling valve as standard on the big 1,150-horsepower Caterpillar C18 ACERTS would be the right play. Engine-room access is through the cockpit and there are also soft patches above in the saloon sole for major service. 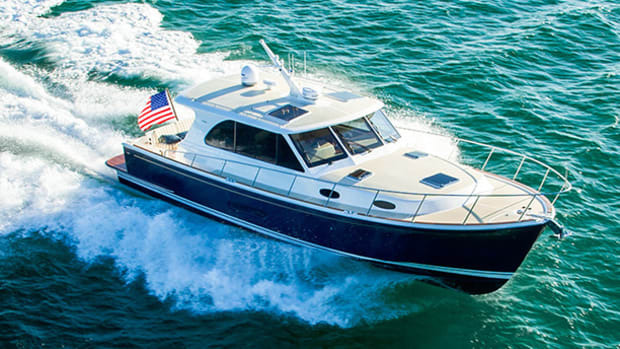 Livingston is hyper-focused on serviceability and access on all his boats, and he met his own goals on the 55. 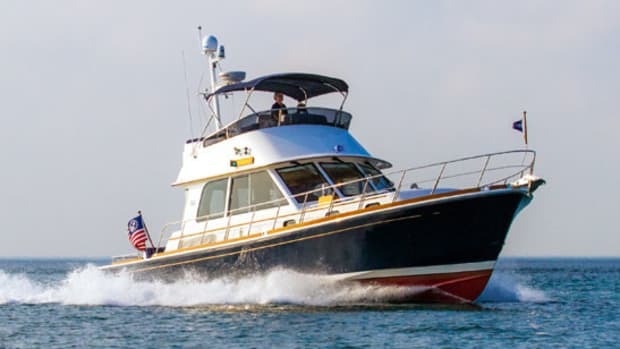 We pulled into the crowded Nantucket Boat Basin, where Josh easily manuevered through the tight marina aided by bow and stern thrusters and darn good helm skills. When he was about to pivot into our slip I heard a shout from a nearby boat in broken English. “How fast does dat boat go?” I instantly recognized the gentlemen standing beside the questioner in the cockpit of a nearby surface-drive-equipped boat as the founder and chairman of one of the largest and most successful boatbuilders in the world. He was in town for a dealer rendezvous. “Thirty-four knots,” Josh answers, while effortlessly backing down. “Nah, there’s no way!” shot back the naysayer. Josh shrugged his shoulders with the self-satisfied smirk of those who know they’re right but could care less about proving it to others. Although I’m guessing there was a bit of pride as well. I placed my test gear in my backpack and meandered down the docks toward the taxi stand at the bottom of Main Street. I stopped to take one last gaze at Lenox. It was tough not to. She tugged at her lines surrounded by superyachts and boats of all kinds, her engine-room blowers still buzzing. On deck Josh, his wife, and kids all were cleaning their new yacht with care and devotion. 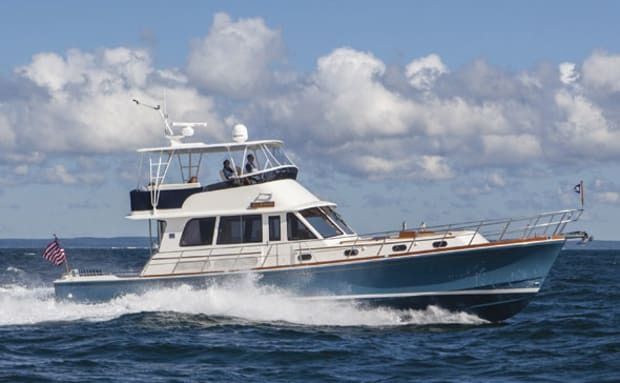 Lenox had indeed found a good home, and this boating family had indeed found a good boat. full fuel; full water; 11 persons, extra gear.